Dual Height Step Stool for Kids and Toddlers. Big Step stools were created with safety for your little one in mind. Bathrooms are generally designed for adults, and navigating in the potty area, or a kitchen can be a challenge for a young person. Big step is the solution to this problem. Each stool has 2 handles, and 4 rubber feet to keep the stool from sliding around when being used. Big Step is the perfect height boost for your little one. SAFETY: Each stool has 4 non-slip rubber feet to ensure that it will not slide around when your child steps on it. Each step also has a rubber insert to keep little ones from slipping off the stool. 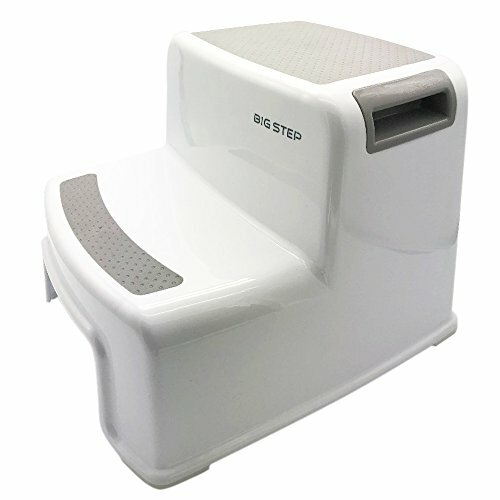 Each Big Step toddler step stool comes with colored rubber padding on the top of each for convenience. EASY TO USE: Each potty training stool for toddlers comes with a handle on each side so that it can be easily moved or adjusted. Big Step stool for kids is the perfect height boost bathroom step stool for your kids. Each stool is light weight and small enough to not be an inconvenience. ENVIRONMENT SAFETY: Each stool is created with non-toxic, BPA free plastic and can be used in your home with confidence. Be safe with Big Step. LIFETIME GUARANTEE: We stand behind our product at Grin Real Nature. Each stool is guaranteed for life. Please reach out to us if you ever need anything. The product must be sold by Grin Real Nature- the only authorized dealer of Big Step stools. If you have any questions about this product by Big Step, contact us by completing and submitting the form below. If you are looking for a specif part number, please include it with your message.